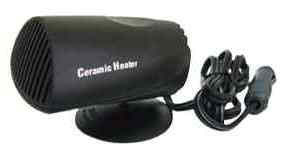 200 watts of instant heat from your 12 volt outlet. Use as a supplemental heater or on dash as a window defroster. Unplug when not in use. Dimensions: 5" front to back, 4" W X 3" H. 65" cord and 16 gauge wire size.